The experts agree that high contrast colors are good for baby eyes.That's my excuse and I'm sticking to it. This blanket uses high contrast black and white patterns and Alexander Henry's super amazingly quadruplefantastic Folklorio fabric line. I adore it so much I want to go to bed with it. Not like that pervs...I shall make some pillowcases or something civilized like that. When my friend that painted my skull face last Halloween (see pic below) said she was having a baby I almost peed myself, because I knew for once I could go W I L D on this baby gift. 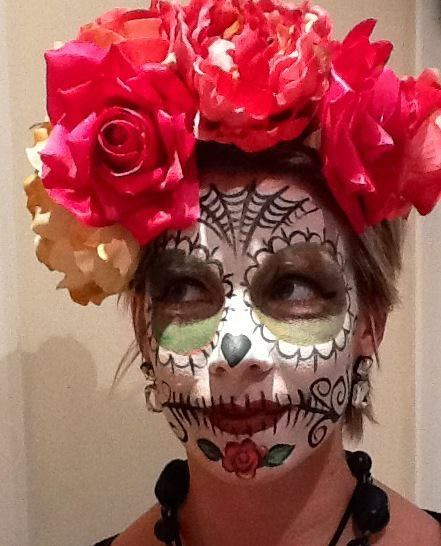 I was a Frida Khalo-esque skull lady. So "go W I L D" I did indeed. 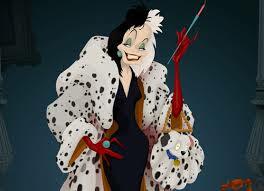 I love the fashion of Cruella De Vil and took some notes from that. *I lorrrrve those red gloves yo! The flying geese I was working on last week were incorporated for some geometric interest. I can't wait for Baby to say "Oh Mum, look at those perfect points on the triangles"...... hahahaha. The orange binding was icing on the cake, I made it with my awesome Simplicity Bias Machine maker that my Dad got me in 1857. I use that thing so much I'm afraid it might catch fire. Simplicity really needs to contact me to be their rep, I would be just darling at it. I departed from my usual binding application and instead did a tiny zig zag stitch so it can withstand tugs and pulls from Baby. I picked up this tip from my Mother. She knows e v e r y t h i n g.
Why we don't realize our mothers are geniuses until we're past thirtysomething is one of the Universe's great perplexities I suppose. I'll see you soon, and thanks for stopping by, I love you. And if you leave a comment, pin this post, share it on FB, or tweet it I will send you a million dollars. holy cow. HOLY COW! now that's sewing for children i can get behind! i'm tweeting this mofo. I'm not kidding-- please stop making me want to quilt! LOL! So rad! That print looks awesome with the black and white. True about not realising how amazing our mums are until our thirties, I'm just glad I did! This is a fabulous baby quilt. My niece is having her second child in about six weeks and I've been planning a perfectly bland (by comparison) little boy quilt. I may have to rethink this decision! You're such an inspiration, girlfriend.